Being a Mum, especially a Mum of two children with sensitive skin, it's important to find the best products for them. Lucas has the most sensitive skin and it truly breaks my heart. We struggle to use many bath products, washing products but most of all, baby wipes. 98% of the baby wipes on the market bring him out in the worst rash on his bum. Most brands we would only need to use once and he looks like someone has burnt his little bottom. He blisters immediately, it's horrendous. We have to buy pure water ones. Having one child with an extreme case of sensitive skin (verging on an allergy) and a very little baby, I like to use products I know will be safe, gentle, protective and yet strong enough to clean and leave them feeling fresh too. There's a few companies I've boycotted and really don't like to use and refuse to buy but that does mean I have to spend a little extra on wipes, bubble baths, body washes, shampoos, washing liquid and fabric conditioner to name a few things. I'd rather spend more and protect my littles and their delicate skin. Lucas has a complete phobia of water near his eyes as he's scared of bubbles in his eyes. The first time I used the Neutral shampoo, he went to panic and then realised it was the first time that when Mummy says "this won't hurt your eyes," that she was telling the truth. It was a relief to wash his hair and not have any tears. He actually even wanted to put bubbles on his head like Iris. It's been a huge stepping stone for us. Lucas likes to clean Iris and I don't really like it usually as he gets it into her eyes and although she's not scared of water over her face (she actually loves going under when we take her swimming), I don't like most shampoos getting into her eyes as, although they specify it's okay for eyes, it still stings. Lucas loved washing her hair and Iris just laid their smiling as he foamed it over her face and head; he's a super caring brother. The bubble bath made seriously good bubbles and Lucas loved splashing around with his boat and toys and putting bubbles on his and his Sister's head. 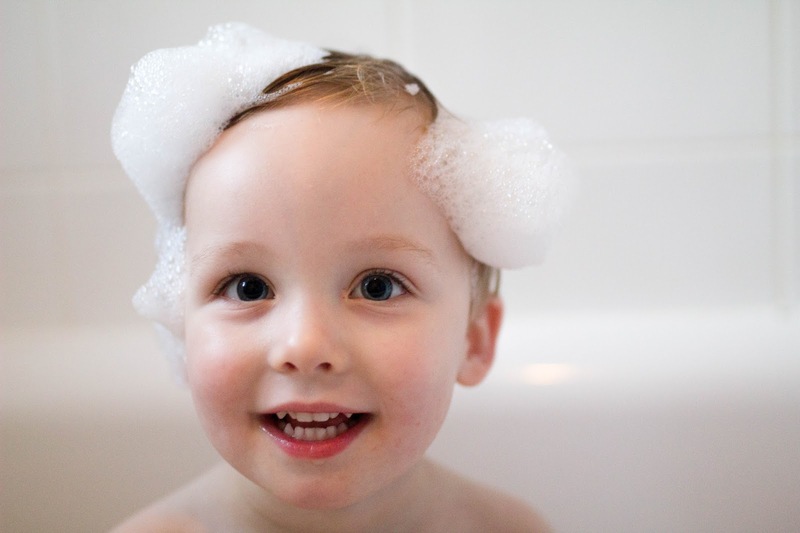 We have tested out the baby bath and wash gel, baby shampoo and baby wipes. All have been a hit and I absolutely love them. Along with one other brand, they're the only wipes we can use on Lucas' bottom and they haven't bought him out in a serious rash. He has a smooth little toddler bum still after using them. YAY! Iris has that cute, newborn peachy bum still and I love to protect it and really liked these wipes for her too. Neutral as a brand is very much becoming one my favourite baby product ranges. Neutral is company that originated from Denmark and has worked with the Danish Asthma and Allergy association for over 25 years to develop clean, mild products that can help reduce the risk of allergic skin reactions and hypersensitivity. This is perfect for our family, mostly Lucas as we're about to seek medical advice for his sensitive skin and hopefully find a cause but finding products that compliment his skin and work well for us is important. Neutral have a wide range of products too. Items that we use or would use as a family include the washing up liquid, laundry detergent, fabric conditioner, baby shampoo, baby bath and wash gel, baby wipes, hand wash and soap bar for starters. I am looking at changing my daily face routine products too so am eager to try the Neutral face wash, tonic, cream and make up remover wipes. Neutral has proved to be a really good brand for Lucas and Iris. It's made a positive change on bath times and seeing it not bring Lucas up in a horrific rash gives it my ten star rating. I mean nothing is more heartbreaking then seeing your child so nervous of having his nappy changed because he doesn't want to become sore again.